I love how it turned out. It's actually one of my favorite layouts now. I'm so glad I played along. 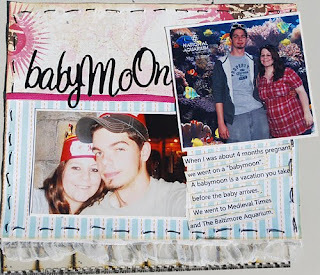 The pictures are of me and my hubby on our "Babymoon". As the layout explains - a "Babymoon" is just like a Honeymoon only instead of in celebration of your marriage - it's in celebration of the baby that is on it's way. A Babymoon gives parent's the chance to relax a little before all the excitement of the new arrival. I was about 4 months pregnant here with my daughter. We just took a small four day trip to Baltimore, Maryland. While we were there we did some shopping, visited the Baltimore Aquarium, and went to Medieval Times for the first time. Yes, the stamping is crooked. I wasn't concerning myself over stamping in a straight line to much because I wanted it to have somewhat of an imperfect look. I even stamped off the page a bit. The paint splatters and crooked sewing add that same imperfect touch. I used paper by Echo Park and Bo Bunny. The little golden frame is by Making Memories. The little heart puffy stickers that are in the frame are by EK SUCESS. 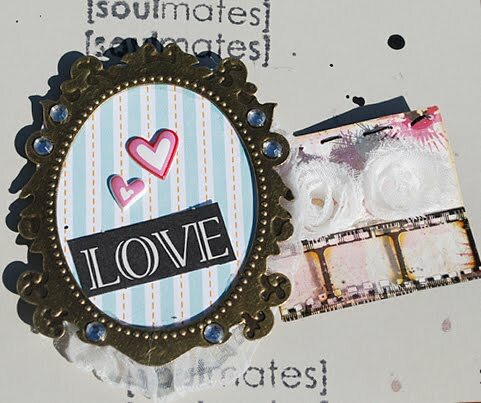 The stamped sentiment is a part of the Hugs and Kisses stamp collection by Hampton Art. The white rosette trim and the film strip ribbon are both by Tim Holtz. The alpha Stickers are also by EK Success. This turned out nice. Good luck with the challenge! 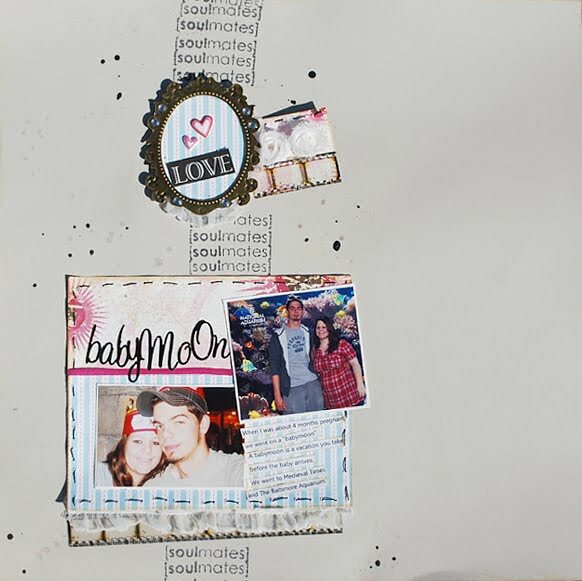 Love that you had a Babymoon! Some of my friends did that, too. Great page design, too! Thanks for playing along with us at Sketchy Thursdays!